Dr Catherine Kent gives two talks about early Berwick during April 2019. On Monday 8th April she speaks to Norham & Ladykirk Local History Society on “Early Berwick”, at 7.30pm in Norham Village Hall. On Wednesday 17th April she speaks on “An English Broch La Roundele, and the beginnings of Berwick” to Berwick HIstory Society, at 7.30pm in the Parish Centre, Berwick (following the AGM at 6.45pm). The Record Office has embarked on its Twixt Thistle and Rose Project, which aime to recatalogue the historic Berwick Borough Archives collection. It offers various volunteering opportunities including cataloguing, research, writing blogs, transcription, and conservation repackaging. Two meetings are being held to explain and to recruit volunteers, on Saturday 23 March and Tuesday 26th March, in the Record Office in the Library Building, Walkergate. Both meetings start at 2.00pm. If you would like to find out more, come along to one of them the organisers of the project. On Wednesday 27th March 2019, Linda Bankier will give a talk on “The Ford Estate at the time of the Waterfords” to the North Sunderland & Seahouses Local History Society. The venue is St. Paul’s Church Hall in North Sunderland, and the talk will start at 7.00pm. The FBDMA Spring lecture and AGM will be held on Friday 15th March 2019, in the Parish Centre, Berwick, at 7.00pm. The AGM will last for about 30 minutes, after which light refreshments will be served. 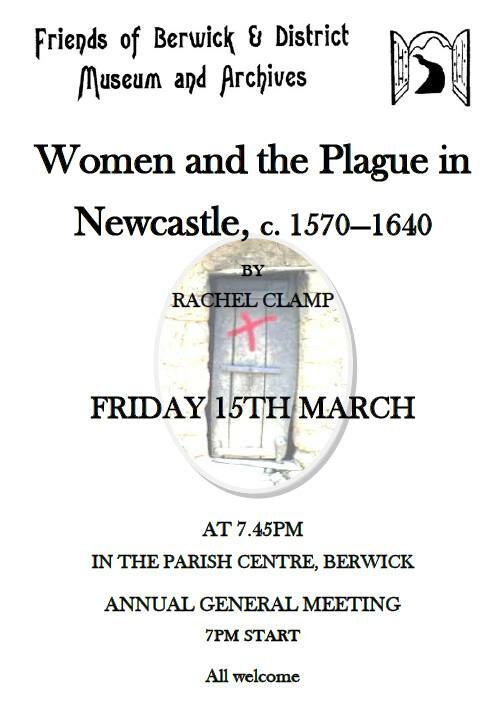 The lecture, beginning around 7.45pm, will be given by Rachel Clamp, speaking about “Women and the Plague in Newcastle, c.1570-1640”.